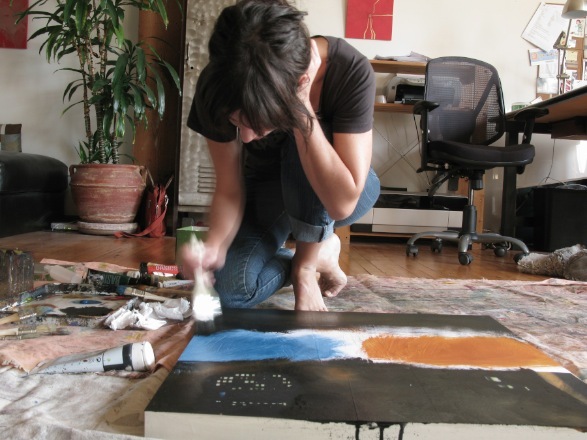 A native of France, born of Italian parents, Liz Brizzi grew up in Los Angeles. 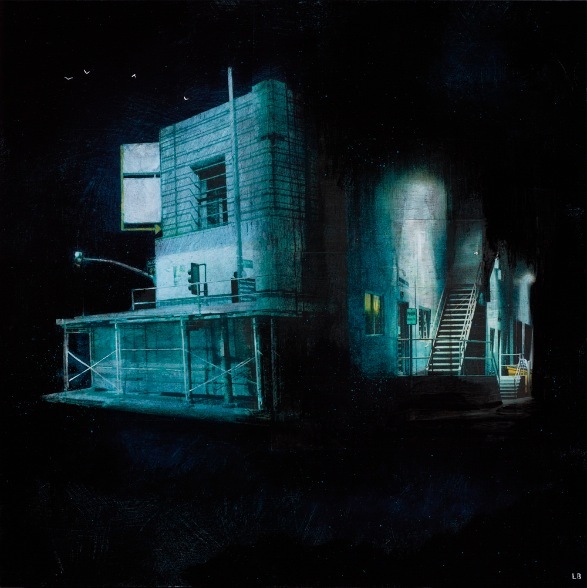 Inspired by urban themes, she loves to portray the beauty she captures in the raw, desolate and industrial aspects of cities and their outskirts. 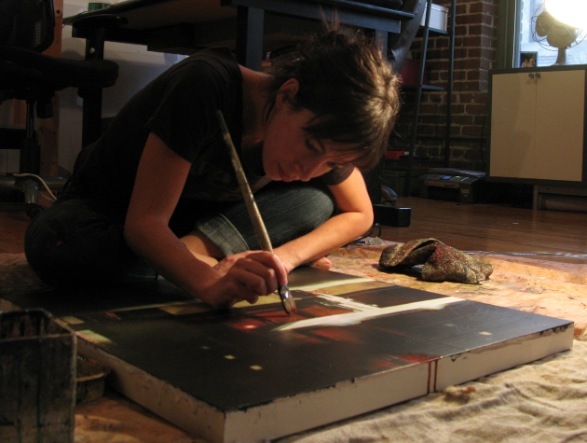 Her unique mixed media technique begins with the manipulation of her original photography collaged onto acrylic painted wood panels, finally blended within layers of colorful acrylic washes. 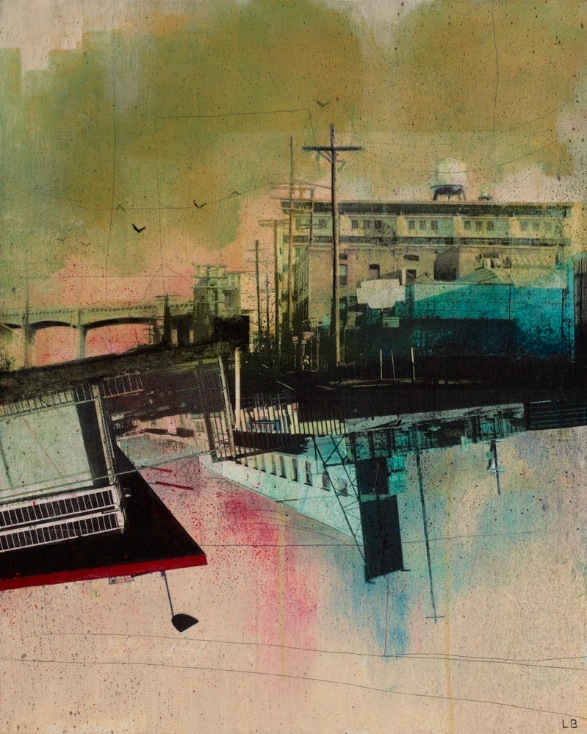 She began this series of works with landscape paintings of the streets and alleys of Downtown L.A. A city that is currently changing and developing rapidly, her artwork captured its authenticity and some of the disappearing traces of its History. 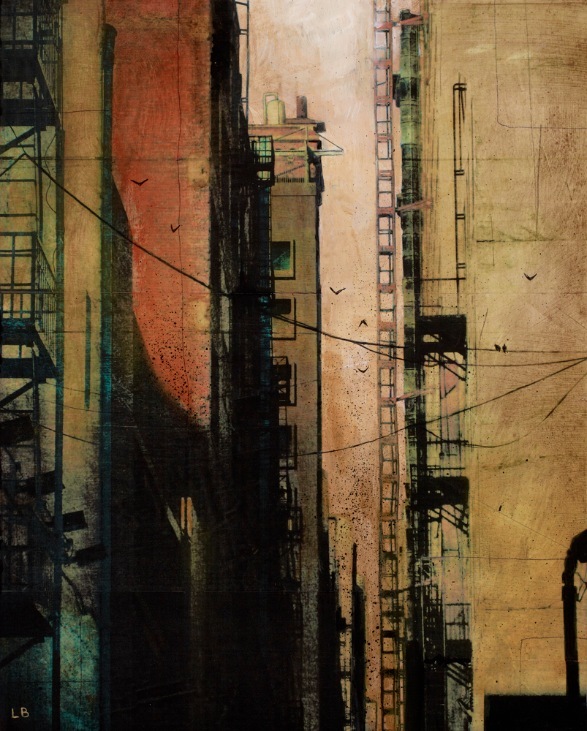 Her more current work is less lifelike, as she utilizes various architectural details found in her photos to create more complex graphics, structures and imaginary landscapes, while using shapes reminiscent of street art found in the very same cities she photographs. Can you share a lil’ bit about your new body of work that will be on view this February? I sure can! These new pieces have a lot of my usual cityscape elements and moods… but I did several paintings which I call the “night time series”. It’s something I had only done once before at a previous show; the setting for those is… you guessed it… night time. I just love the contrast and play in colors that it allowed me to play with. I am very fond of driving through downtown at night and love the atmosphere that is created by the dim security lights on the warehouses and buildings. So I tried to bring that into these new pieces. There is also another piece that brings newness to the show. It’s a piece I did on reclaimed wood from old palettes. I’m excited to introduce this concept into my body of work and really look forward to doing more. What draws you to the desolate and derelict areas of our city? I’ve tried to figure that out myself. At first it was inexplicable even to myself. Why am I so attracted to these old dirty alleys and buildings that are falling apart? The only explanation I can think of is this one… To me, there’s something really beautiful about things that are not “perfect”. I live in Los Angeles, where the city’s whole culture revolves around perfection. People want perfect faces, perfect bodies, perfect new houses, with perfect lawns and perfect weather. I’m not complaining. I love living here. I have perfect fun here. 🙂 But sometimes, it ends up looking very fake, and bland, and boring. And mostly… very new. I think, and maybe it’s because I’m European, I love it when I find something here that is old, and shows marks from the past… something that is somewhat imperfect. Stained, lived in, sometimes falling apart. That is why I started taking photographs of Downtown Los Angeles, which I completely rediscovered when I moved there. I love it. I feel like it’s the only place in LA that is old and historical. Just like its bridges over the LA river. I love them so much. I live right next to one. So, that fascination of mine evolved and I started exploring the outskirts of LA, where I found almost surreal places (see my “Hobart Station” or “Outskrts” paintings). I love those places. They’re like… my little secret. They’re so detached from the “Hollywood” world. They’re hiding. But they’re real, and I sometimes feel they are the City’s heart beat. I think it’s just the most rewarding work you can do. I love “making stuff”. You start with a concept in your head, an image… a sudden idea you may get from seeing or hearing something that inspires you. Then you take that and bring it to life, building it from A to Z. Then you have something to show for your hard work. You made that. And when other people enjoy it too… well it’s just really rewarding. I also couldn’t see myself doing anything else. I will never go back to an office desk job. So I gotta keep up with creativity if I wanna to stay on its path. My computer, my awesome new printer, and my inspiration board. Oh yeah! I definitely wanna dedicate these few lines to your partner in crime L. Croskey. Aside from being an amazing artist and curator, LC has been a mentor to me (and many other artists!). I came to him with my first few pieces about 3 years ago, and he gave me the advice and constructive criticism that I needed to hear. He gave me my first show with Cannibal Flower, and then helped me grow as an artist as I went back to him for more words of wisdom. I owe him a lot and have a lot of respect for him as a mentor and fellow artist. So yeah… Thank you LC. I’m excited to have a feature in Blue Canvas Magazine #12 coming up in April I think. Then I should have a show at Curbside Gallery in Santa Ana this summer. And I’ve been in touch with a couple of galleries in Paris that are interested in showing my work, so hopefully I’ll be showing there around the end of the year.